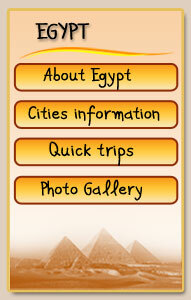 Day tour to Giza (where is the great famous pyramid of King Cheops and the great sphinx), Sakkara (where is the first pyramid was built in Egypt) and Memphis (the first capital of Egypt). After breakfast meet our licensed tour guide in your hotel at 8 am, then you will be transferred to Memphis museum where you will see the colossi of king Ramses the 2nd and the ruins of this ancient capital of Egypt ,then to Sakkara to see the steps pyramid and the oldest funerary complex surrounding it ,break for lunch and then on the way to Giza short stop at one of the papyrus factories to see before your ayes how the ancient Egyptians were making it, then to Giza plateau to see the famous three pyramids of Cheops, chephren and Mycerinus and the great sphinx, the last stop in the tour it will be in your way back to the hotel you will stop at another factory of the flowers pure extracts and the plow oriental chaps glasses , then drive back to the hotel. • Meet & assist upon arrival. • All transfers to/from airport & hotel by a private air-conditioned vehicle. • All service charges and taxes. 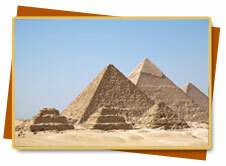 • Egypt entry visa, for non restricted nationalities you can buy it upon arrival before passport control. Visa Cost $ 15 = 11 Euro per person adult or child. • Drinks and any personal expenses. N.B: Single travelers will be charged for an additional 20% as a single supplement.